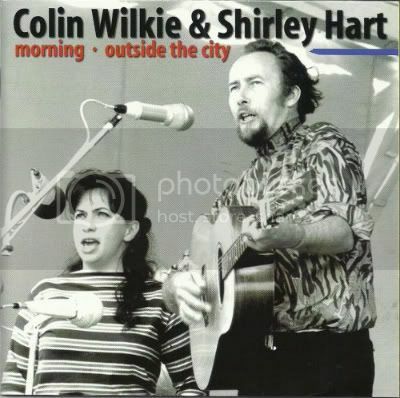 The folk revival of the 1960s came to Germany through the playing of British-born singer/songwriter Colin Wilkie and his guitarist/vocalist wife Shirley Hart. The composer of hundreds of songs and stories, Wilkie spent 11 years as resident songwriter for SWF show Tellekolleg and seven years as host of his own weekly radio show. He passed on his unique fingerstyle approach to the guitar to influential German guitarist Franz Josef Degenhardt. Wilkie's songs, which reflect on family, friends, political, and ecological themes, offer only a hint of his warm, intimate, stage persona. Wilkie and Hart's first album, released in 1965, was recorded with Scottish folksinger Alex Campbell. Musical theater has provided another outlet for Wilkie and Hart's talents. Their appearance as street singers in a production of John Arden's Life and Death at the Wuerttembergi National Theater in Stuttgart, helped to make the show so successful that it ran for several years. 19. Where Were You In the War? Ha! Have you ever heard them with Albert Mangelsdorff on MPS 15229 - "Wild Goose" from 1969? Free Folk and then some! Anyway, thanks for this album, zero! I missed it. Glad you posted this rare album. Thanks, zero! Thanks, zero, really nice to see and hear those albums again. There is another rare one by the duo called "We Travel the Road" on German Polydor with has John Pearse and Ladi Geisler (!) on twelve string guitar supporting Wilkie & Hart. By the way, German electronic hip hop projects lotte ohm. and Instant Wilkie are the brainchild of Vincent Wilkie, son of Colin and Shirley, who started his musical career in 1974 as a five years old kid banging spoons on his parents' record "Outside the City" (Pläne Records). Greeny, thanks a lot for these infos. Best wishes!